They are not just for weightlifters. 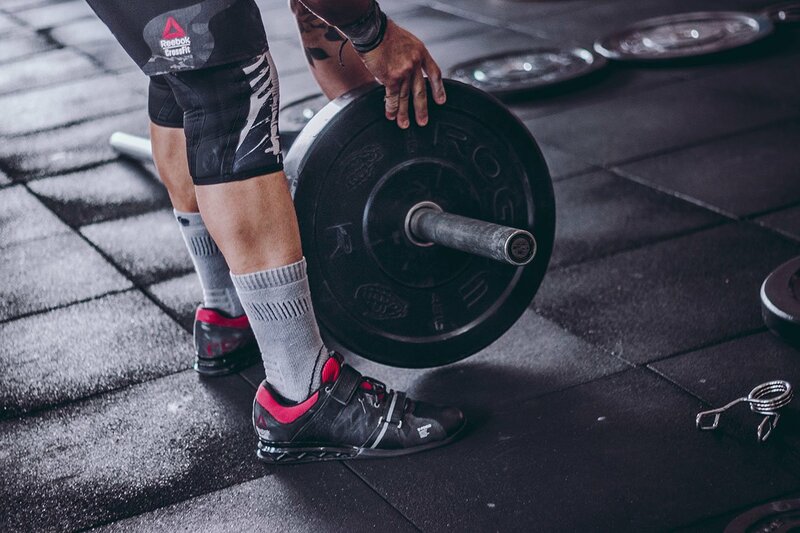 Athletes from other sport also use weightlifting shoes, for example powerlifters use them for the squat and benchpress and cross-fit athletes use them in some of their workouts. Why are the right shoes so important for your lifting? In the sport of weightlifting it's important to use good quality shoes, because inappropriate shoes can cause more harm than help. However people often tend to overlook this and show up in the gym to train weights in running shoes. But aren’t running shoes just fine? The answer is NO, because they will limit your strength and prevent good lifting technique. The soles are squishy that makes them unstable and the soles also absorb the force generated against the floor instead of directing it towards moving the weight. In other words, you lose strength. Not to mention the higher risk of injury, especially with heavier weights, since the soles make it hard to balance yourself and are less stable. So what are the benefits of good weightlifting shoes? More Stability. Better traction against the floor and improved balance under the bar because the soles are hard. More Strength. Your heels will sense the pressure of the weight better, which will make your legs contract harder. Better Technique. Good lifting shoes will fix many technique issues. You’ll sit back better and the heels will stop you coming off the floor. More Safety. Better balance, better technique, all of it decreases the risks of injury during lifting. Better Angles. For most people, it is easier to perform correct technique and to hit the depth in the squat, when you have an elevated heel. When you squat down, it is easier to avoid the knees moving too much forward, if the heels are elevated relative to your toes. Adidas Adipower weightlifting shoes have create a lot of controversies around when they first appeared on the market, allowing weightlifters from all over the world to take their performance to the next level. Since many weightlifters are rather skeptical about the efficiency of Adidas Adipowers, these shoes were not as popular as others, even though many participants in the Summer Olympic Games in have used them. Adidas Adipowers have firstly appeared on the market in 2008, coming with kangaroo leather upper that was very resistant, yet it did not provide decent breathability to the user, which made them difficult and unpleasant to use. Moreover, the first Adidas Adipowers had the annoying habit of sliding to the side of the foot during the workout session. Adidas made sure to solve this problem by making the tongue more of a sock liner, so it was not sliding to the sideways anymore. 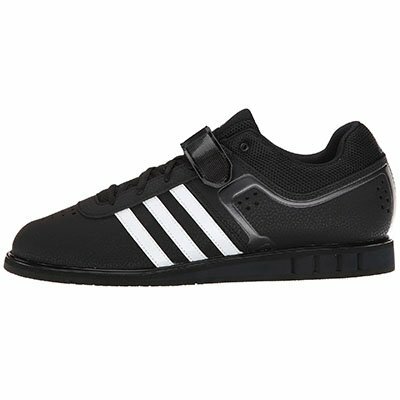 Adidas Adipower weightlifting shoes are ideal for any weightlifter since they were specifically created in order to ensure them of flexibility, comfort and cushion while lifting weights. The solid construction can resist to extreme effort, so investing in these shoes represents a wise choice that will bring you plenty of benefits in return. The woodblock heel was completely removed from the old Adidas Adipowers and was replaced with a TPU heel that is significantly lighter and stronger as well. 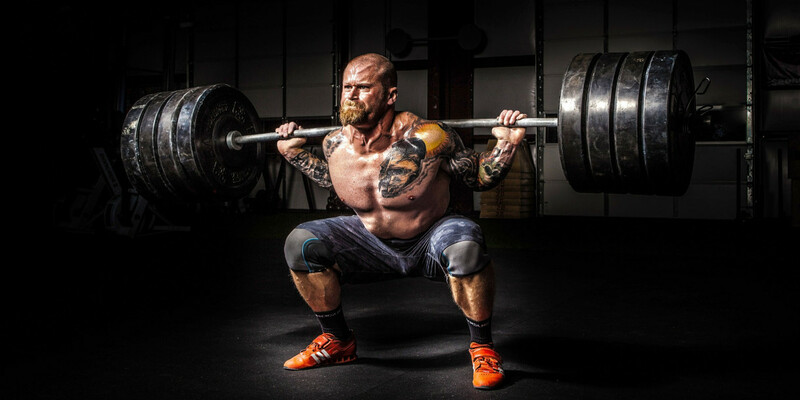 Not only do they provide weightlifters with a better experience within their performance, but they also erase away many previous downsides that made them inappropriate for using. Actually, Adidas Adipower are the best weightlifting shoes available on the market, coming with many great features for the buyers and a decent price that makes the very valuable and also affordable. Even though there are several other brands that manufacture similar shoes, they cannot beat Adidas Adipowers, which are expected to remain the top weightlifting shoes for the next four years. When Pendlay came up with its own weightlifting shoes, the customers weren’t surprised. If you consider that the company has been manufacturing a wide range of bars, weights and other gym equipment, it makes sense to launch a pair of good weightlifting shoes to match your line of products. The company used its wide knowledge base and expertise to produce Pendlay Do-Win weightlifting shoes. These weightlifting shoes from the brand look stylish and feel comfortable. This model clearly shows that Pendlay gave a lot of attention to every detail. The first shoe in the Pendlay Do-Win Weightlifting shoes series was released a couple of years ago. Most customers believe that these shoes meet all kinds of requirements of a good weightlifting shoe. They also look very stylish and peppy. Since these shoes have a solid-grain leather exterior, you don’t have to worry about durability. These shoes will last for a very long time. The mid-sole has been designed with mesh to offer breathing ability. The heel of the shoes has been manufactured from an enforced wood block. Although the leather exterior in these shoes is a bit stiffer than suede, it is able to provide a very stable base. However, you will need to get used to them. Most of the models in this series have taken into consideration people with wide feet. Thus, people with wider feet may feel a bit more relaxed and comfortable. Moreover, people who feel comfortable in regular athletic shoes will also love this model. The heel of the shoe is 0.75 inch. This is the average height recommended for most Olympic lifting. The best part about the Pendlay Do-Win Weightlifting shoes is that they feel very comfortable on your feet. These shoes are a bit wider than other standard weightlifting shoes available in the market. Since the standard heel height is 3/4th inch, you don’t experience any problems while walking. If you have wider feet, these shoes won’t feel constricting. You will completely enjoy working out in these shoes. An additional benefit of the Pendlay Do-Win Weightlifting shoes is that they’re very affordable and inexpensive. Since these shoes are also very durable, you don’t have to worry about spending a lot of your hard earned money on shoes frequently. For men, these shoes are available in two different color options. However, women don’t have any choices. They can only buy these shoes in one color. While men can choose between red and black, women can only buy purple. For most customers, this seems limiting and less appealing. While the purple color looks stylish and shiny, some people might consider it to be a bit over-the-top. Most weightlifters don’t like such attention. Despite of the flaws mentioned in this post, the pros of Pendlay Do-Win Weightlifting shoes far outweigh the cons. These shoes are very affordable, comfortable and stylish. 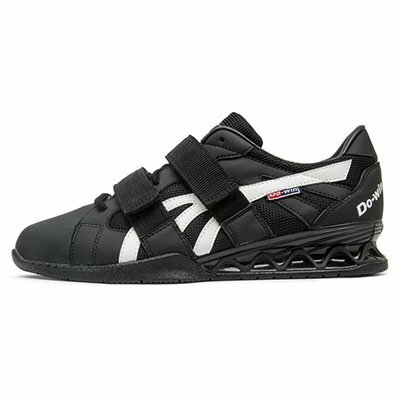 Do-Win Weightlifting shoes are a much better choice than standard athletic shoes. These shoes have been designed by a high quality weighting company. The company has a wide base of knowledge and experience, and they have continued to improve. These shoes can be perfect for people who want to upgrade from standard athletic shoes to a specifically designed weightlifting shoe. These shoes are very affordable. Since they’re durable, you don’t have to spend your money on a frequent basis. These shoes are very comfortable on wider feet. Many customers don’t like that Pendlay Do-Win Weightlifting shoes are available in limited colors. These shoes are not very durable for other purposes besides weightlifting. People believe these shoes are not appropriate for running on the treadmill, jogging and so on. Adidas Power Lift Trainer shoes have been specifically designed by Adidas for the growing market of athletes and fitness enthusiasts. In recent years, these people have become aware of specific needs for proper shoes while weight training. In this new shoe, Adidas has used a leather upper, comfortable fit and 0.60 inch heel manufactured from EVA. Due to this, these shoes are affordable, and allow heavy weightlifting. In the last few years, Adidas have come up with many different models for weightlifting. The history of these shoes precedes this particular model. Adidas launched Power Perfect II in early 2011. This was a very affordable Olympic lifting shoe. It was specifically designed for non-competitive athletes. Adidas Power Lift Trainer shoes replaced the discontinued range of IronWork 3 and Power Perfect models. With the Adidas Power Perfect II already available in the market, Adidas needed to design shoes which could easily meet the specific needs of fitness enthusiasts and recreational lifters. In simple terms, it needed to come up with shoes which were durable, affordable and offers an easy and quick transition from lightweight trainers in the market. This was the main factor which led to the production of the Power Lift Trainer shoes. Basically, the target market was people who just wanted to hit the gym, but didn’t want to spend hundreds of dollars on a pair of shoes. Just like the Adidas Power Perfect II, Adidas Power Lift Trainer shoes have also been constructed with synthetic leather. However, in order to reduce the cost of these shoes further, EVA material has been used to construct the heel of this model. EVA is a very lightweight polymer. It is harder and denser than rubber soles, but lighter. It is worth mentioning that the Power Perfect II is available in just white color with red accents, while the Power Lift Trainer shoes are available in 5 different colors. Due to the use of EVA material, the shoe feels very light. Moreover, since the heel is only 0.6 inch, these shoes are exact height recommended by some of the best weight training coaches in the world for powerlifting. Most people think that EVA is not super dense like rubber, and therefore, these shoes might begin to compress under heavy pressure. However, many heavy weight lifters have been using these shoes for performing their weight training routines, and they never complain. 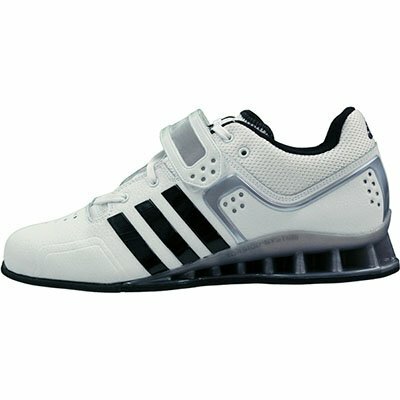 It is true that the Adidas Power Lift Trainer shoes are not meant for experienced power lifters. However, they are perfect for beginner to intermediate level power lifters. They are also good for people who’re just performing presses, squats, benches or dead lifts. According to some customers, Adidas has once again run a bit tight in the area surrounding the forefoot. Therefore, people with wider feet may experience some problems. Some people also believe that the forefront of the shoe is a bit stiff. However, once you make a few trips to the gym and get used to them, you won’t experience any further problems. Since the sole of these shoes are the same which were used in IronWork models, the grip is perfect. Overall, the construction and styling of the Adidas Power Lift Trainer shoes seem quite promising. Most of the customers have appreciated and praised the quality and feel of these shoes. These shoes are also durable, and easily last a very long time. The Adidas Power Lift Trainer shoes are currently the best trainers meant for beginner and intermediate level power lifters in the market. They look stylish, and fulfill their purpose in every aspect. Since they come from a reputed brand, you don’t have to worry about the quality, feel, construction or durability of these shoes. When it comes to buying these shoes, you can easily purchase them online at an affordable price. However, before making a purchase, it is important to choose a reputed seller. Many retailers offer free shipping and other lucrative discounts. Just make sure you buy authentic products from a verified seller. These shoes have a perfect grip because of the “sticky” gripping soles. They fit like sneakers and provide more comfort. Adidas has given a lot of attention to detail. They can feel a bit uncomfortable for wider feet. The heel feels quite lightweight. Shoe laces are very long.